About Kellie | Kellie Speaks Happy! Kellie Grill is a Happiness Expert, Motivational Speaker, Author, and Songwriter. She has studied and researched the effects of Happiness and Positive Attitude for over 27 years. She is a proud member of the National Speaker Association and Past President of the NSA-Oregon Chapter. Kellie works with people who want more happiness in life and employers who want happier more productive employees. Kellie’s audio book is called “Happiness Is Here-Simple Strategies for Staying Happy”. Kellie and her husband Dave live in Wilsonville Oregon on a horse ranch called Whirlwind Ranch. They have 3 children and 2 granddaughters. 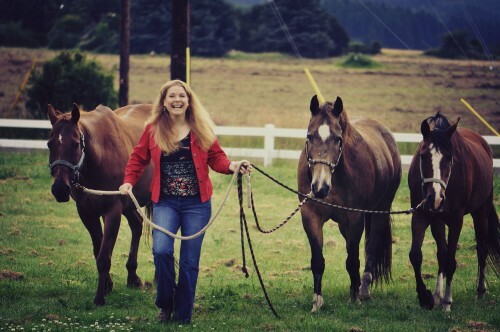 Kellie is Chairperson for Oregon Horse Country. Kellie and Dave’s first book is their critically acclaimed non-fiction love story called “Send Me a Sign” co-written with Doug Binder. A portion from all of Kellie’s speeches, book sales and happiness retreats goes to Breast Cancer Research.